Residents of the Capistrano Valley Mobile Estates have not had such a great view as they peer out from the backyards of their homes recently: The area surrounding the development has become inundated with tents and trash from a population of homeless people they say is growing. 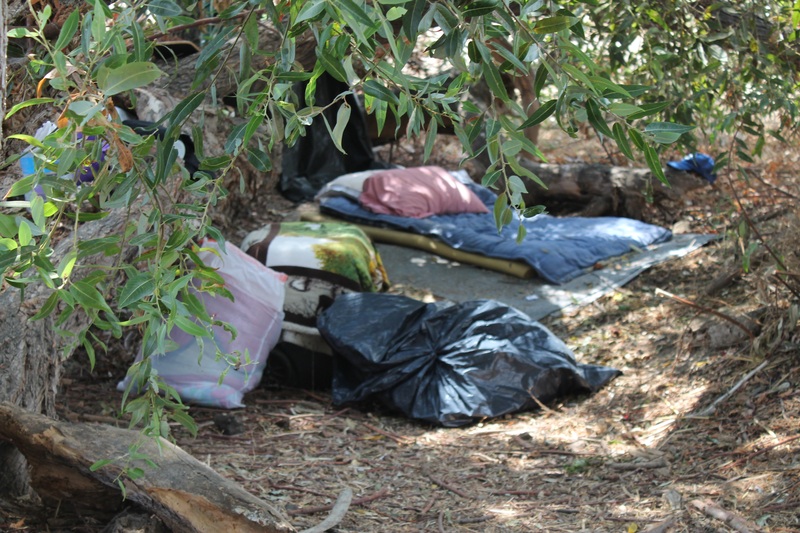 They say the homeless have contributed to a wide variety of problems; they’ve been seeing trespassing, using drugs and the noises they make at night have led to some of the park’s residents being kept up. Hilde, a driver for Uber and Lyft, said he will drive his car in the early morning hours and has seen people laying outside the block wall fence at the park entrance and others walking along the nearby railroad tracks to get to their camps. Tents have been set up in various locations that are visible from the Mobile Home Estates. There are tents located on the embankments behind the car dealerships on Camino Capistrano; tents on city-owned lots off Stonehill Drive; and trailers that often stay overnight along Avenida Aeropuerto. Residents said they have seen the homeless at times find their way into the mobile home park itself. Patricia Nigg, 65, said she has called the Sheriff’s Department three times on separate occasions after finding non-residents using the spa and the showers inside the park’s clubhouse. Deidra Hill, 73, said she has seen people jump the fence just outside her home on two occasions. She said she was concerned that a woman she saw scale the fence might end up hurting herself. She’s not just concerned about the trespassing threat, but also that the presence of people, paired with brushy terrain on the embankments and lots, could present a fire hazard. Hill has led the charge in trying to bring attention to the homeless situation to the city council and others. She has sent emails and also spoke during a recent council meeting regarding the growing issue. Hills said things weren’t always like this. She said the banks were clean and nice when she moved into her neighborhood three years ago, but things have gotten progressively worse and the lack of maintenance on the embankments by the car dealerships has allowed for more campers. City officials in an email wrote that they’re aware of the situation surrounding the Capistrano Valley Mobile Estates. They said an interdepartmental team comprised of Orange County Sheriff’s Deputies, Public Works and employees from the City Attorney’s Office and City Manager’s office have not only met to discuss the “challenges identified adjacent to the Capistrano Valley Mobile home estates” but have also made numerous site visits there over the last several months. The statement notes that one challenge is a lawsuit that has been filed against all Orange County Cities, including San Juan Capistrano, regarding homelessness. The lawsuit is being overseen by U.S. District Court Judge David O. Carter. Carter on Friday, Aug. 3, provided an ultimatum that Orange County and its cities either needed to come up with a plan for an emergency shelter for the homeless or he would make a ruling preventing the cities from being able to enforce their anti-camping ordinances. Another complication, the city official noted, is that the land where some of the homeless are staying is private property, placing the impetus on the property owner to either prosecute those individuals who are camping or make adjustments to their property to prevent it. Many of the area car dealerships — whose properties expand out to the embankment – did not respond to requests for comment. The email from the city also cautions that being homeless itself is not a crime. Lisa Howell, who handles customer relations for Nissan of San Juan Capistrano, said the dealership, when it was under different ownership, worked with the city about a year ago to handle some incidences of trespassing. She said that over the last year, she has not received any complaints about people camping there but said if that were the case she would bring it to the attention of her manager and then in turn the city. Officials say the city has since been in contact with the Nissan dealer over some of the overgrown vegetation on their embankment. Hill, Nigg, and others say they’ve been in contact with members of the city council. Hill said that City Councilwoman Kerry Ferguson came to the mobile home estates to learn more about the issue and that Councilman Derek Reeve asked city employees to look into the situation. She said a sheriff’s sergeant who is part of the homeless team has also been there. While the residents have received assurances that the city is looking into the situation, they feel things aren’t be fixed quickly enough. Hilde says he hopes to see the City Council actively discussing the issue soon. “Why can’t something be done with legislation to address the problem besides getting all this extended talk that isn’t happening?” asked Hilde.